With this cool new Campfire Candle you can enjoy the scent of a crackling campfire anytime you wish inside the comfort of your home, minus the roasted marshmallows, hot dogs on a stick, and tasty s'mores. 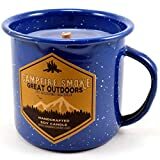 This fun scented candle is made in the USA from 100% soy wax, has an 80+ hour burn time, and is designed to smell just like a real roaring campfire. Perfect for cracking open a few cold ones with friends as you gather around it in your living room and tell ghost stories. It's much easier to light as well.